The team at BlackOut Design is proud to work with BikeScranton, a free bike share program managed by the Lackawanna Heritage Valley. 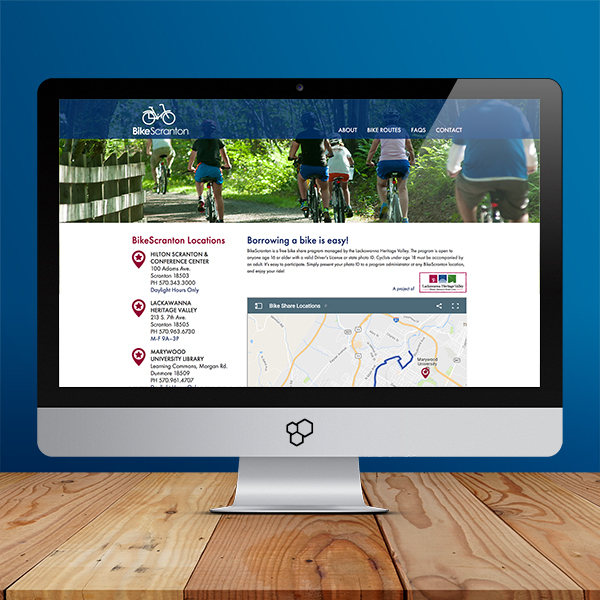 Ahead of the season kickoff, our most recently completed project with BikeScranton included updating their web design and giving their site responsive navigation so that you can view the site from any device. Interested in learning more about the local bike share program? Join the Lackawanna Heritage Valley for the BikeScranton season kickoff event this Friday, April 7, during First Friday Scranton. Just look for the BikeScranton tent on Courthouse Square. From 5 to 7:30 p.m., bicycles will be available to anyone age 16 or older with a valid photo ID. Cyclists under age 18 must be accompanied by an adult. For more information, visit www.BikeScranton.com, or call 570.963.6730, x 8200.